In RPGMaker MV, the default death state is the first state in your database. When this state is applied, a battler (enemy or actor) is considered to be dead. During battle, when all enemies have the death state applied, the actors are victorious. When all actors have the death state applied, they will be defeated. Outside of battle, if all actors have the death state applied, game over. But what happens if you wanted other states to be considered death states? For example, if all actors are petrified, then the game ends. Or if all actors fall asleep, then the game ends. 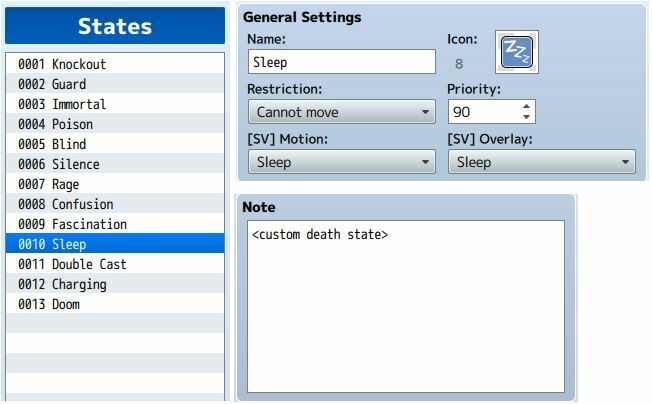 This plugin allows you to designate additional states as “death” states. Unlike the normal death state, actors won’t lose all HP/MP, but they will still be considered dead. Download the plugin and place it in the “plugins” folder in your project’s “js” folder. 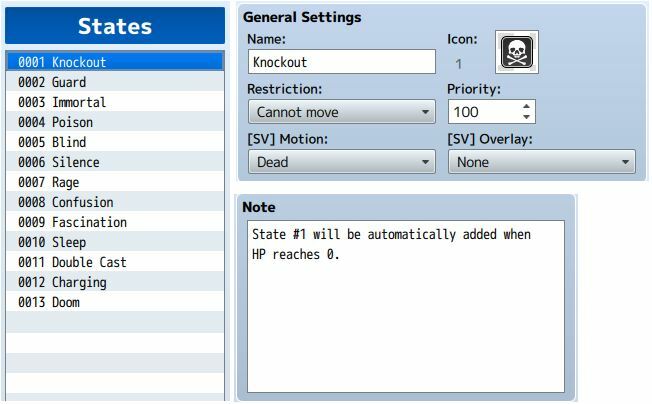 Then open your Plugin Manager (F10), double-click an empty row, and select the HIME_CustomDeathStates plugin. Needed this for one of my games. Can this be used to where instead of triggering a game over, it simply applies a state at 0 HP? I’m trying to use your Party Manager to make a summoning system akin to Final Fantasy X. Can you explain how you are using the state for your summon system? problem is everything works but the state with the tag just acts like death making the character into death sprite and red hp text can it just be where its not red text on hp?